In the early 1980s, North Carolina Governor James B. Hunt, Jr. began contemplating ways to bring history more vibrantly alive for residents and visitors of his beloved state. Acutely aware that we were nearing the 400th anniversary of the Roanoke Voyages that brought Sir Walter Raleigh and the first English settlers to the Roanoke Island shores between the years of 1584 and 1587, Governor Hunt proposed a daring new project that would eventually capture the imaginations of thousands. Why not, Hunt suggested, build a representation of one of the 16th century sailing vessels that not only allowed some of the first Englishmen and women to explore and settle in what was then known as the New World, but that also played an important historical role in establishing the cultural heritage of America as a whole? The North Carolina 400th Anniversary Committee had already been formed, and they received Governor Hunt’s proposal with enthusiasm. 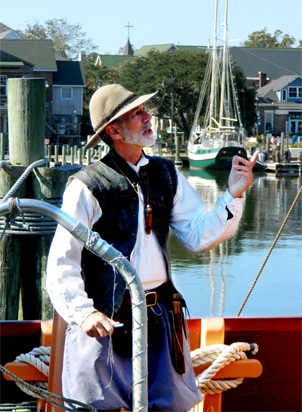 Private funds were raised by the American Quadricentennial Corporation to fund the project, and with input from each of the 100 counties in North Carolina, it was agreed that the vessel’s home port should be located where the first English settlers initially landed—on Dare County’s Roanoke Island. The vessel was named the Elizabeth II, after one of the ships that embarked on the 1585 voyage sponsored by Sir Walter Raleigh. Since no drawings or records concerning the original Elizabeth survived, it was decided that the Elizabeth II should be built according to extensive contemporary research that had been done on 16th century sailing vessels. This meant that the Elizabeth II could not be an exact replica of the Elizabeth, but would instead be a splendid representation of the original vessel. Construction of the Elizabeth II began during July 1982 at the Creef-Davis Boat Shop in Manteo. Though modern techniques and power tools were necessarily used throughout the construction process, every effort was made to remain faithful to 16th century shipbuilding practices, including the use of hand tools such as the adze and ax for the final framing. Even with all this painstaking attention to detail, the cooperative hard work paid off, and the Elizabeth II was first launched four months ahead of schedule—after only 400 days under construction—on November 22, 1983. On hand for this monumental event was Fist Lady Carolyn Hunt, Governor Hunt’s wife, who joyfully christened the Elizabeth II. 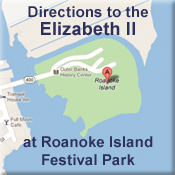 The long-awaited public dedication ceremony for the Elizabeth II was held in Manteo on the weekend of July 13, 1984 as part of a scheduled three-day celebration to commemorate the arrival of the first English settlers on Roanoke Island—and, of course, to mark America’s 400th Anniversary. It was a festive occasion that drew a large number of distinguished attendees, including Her Royal Highness Princess Anne and the popular American broadcast journalist, Walter Cronkite. In all, over 20,000 people gathered in the town of Manteo on Roanoke Island to participate in festivities such as speeches, street fairs, musical shows, and fireworks. Once the formalities were over, the Elizabeth II was officially open to the public, and it was estimated that by late afternoon approximately 3,000 visitors had boarded and viewed the Elizabeth II. The momentum of these early occasions was tremendous, but the Elizabeth II had many more historical moments to come. A little over a year later, on September 19, 1985, the Elizabeth II set off on her first solo sail to much fanfare. Traveling at a remarkable six knots, she made her maiden voyage from Manteo to Ocracoke Island, and then further south to Beaufort and New Bern, North Carolina where she was part of enthusiastic celebrations that included state dignitaries such as Governor Hunt. The dream had finally been fully realized. The Elizabeth II was, and forever will be, historically important. Not only does she continue to represent a vital part of our past, but she also stands as a reminder of the innovative daring we can continue to bring to our future.